After you have installed BI EE, you are asked to reboot your computer (this is for a Windows install). After you reboot and login, you will notice a DOS window which shows OC4J starting. 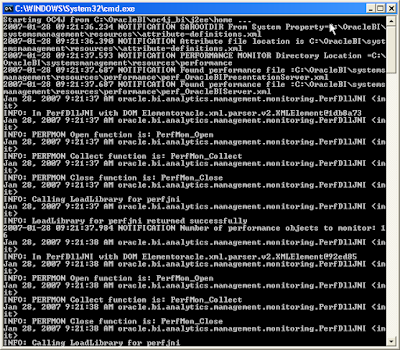 Even if you set all the BI Services to "Manual", this particular command is still fired at startup. This is because the command to start OC4J is set in the Windows Registry. If you go to the Windows registry here (type "regedit" in your "Start --> Run" textbox): "HKEY_LOCAL_MACHINE\SOFTWARE\Microsoft\Windows\CurrentVersion\Run" you will notice that an entry named "oc4j" is created during the installation, which starts up OC4J. 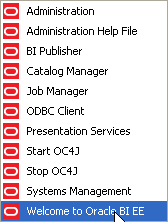 What I generally prefer is to create a small batch file that contains commands to start all required BI Services and use this file to start BI on my machine. And one more to stop these services. 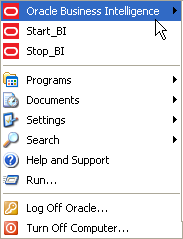 net start "Oracle BI Server"
net start "Oracle BI Presentation Server"
net start "Oracle BI Java Host"
net stop "Oracle BI Server"
net stop "Oracle BI Presentation Server"
net stop "Oracle BI Java Host"
If you see the services started in your Task Manager, sawserver.exe corresponds to the BI Presentation Services, "sawjavahostsvc.exe" corresponds to the "Oracle BI Java Host" service, "NQSServer.exe" is your Analytic Server, while the "java.exe" process is the OC4J process. 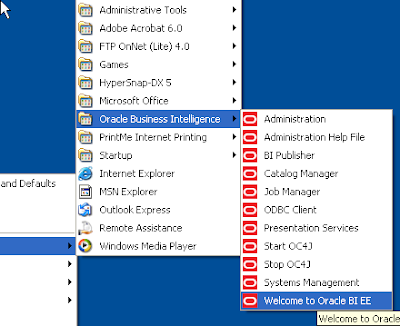 To actually browse to the "Answers" or "Dashboards" page you can either type in the URL if you know it, or use the Start menu option provided in the "Oracle Business Intelligence" folder.